Our last proper meal before starting the first section. Beachcombers in Kaitaia has sorted us out with two fine meals during our stay here, we’d highly recommend. It’s a bit north of the town centre, on the main road. The first section of the trial isn’t very long and pretty flat, mostly walking along 90 mile beach (which is more like 90km), most people will do it in 3 or 4 days. But we haven’t had time to do any warm up walks yet.. So we’re going to take it pretty easy and do over about 7 days. 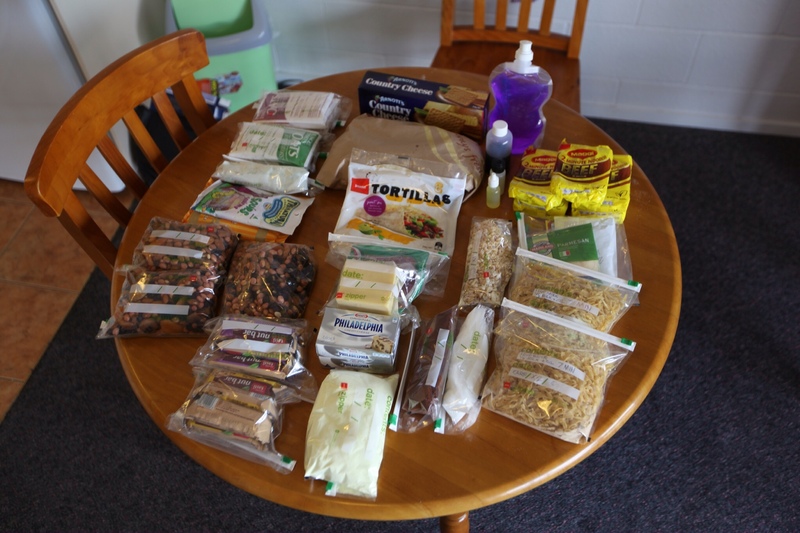 This is what a weeks worth of food looks like, fortunately once we’ve un-packed it all into zip lock bags it looks a bit less bulky! Although water may determine how fast we walk along this section as I’ve read it can be pretty dry.. The stove is a Caldera Ti-Tri by Cascade Designs. It’s made out of a thin sheet of titanium that rolls up into a tube, very light weight. I think the thing I like about this stove the best was the ordering process! Got an email back from the bloke who makes them straight away, he apologised that he was on-trail, in the middle of a hike, but he would make my stove the following week when he was back in his workshop. Felt good to order from, and get it made by a real person. Classic example of lunch here – tortillas are great for pack-ability, loads better than bread and keep for ages. With Philadelphia cheese, not my favorite cheese I’d have to say, but this stuff never goes off! Not sure how long it will last unrefrigerated in a pack, but I’ve carried it for a week or more through burning hot desert and it’s always held up well. We set off super early and did our planed day’s miles before lunch! But horror of horrors, on arrival there was no cafe, pub, or food shop! Oh nooooo! We’re walking pretty early in the tourist season so it seems all the summer places aren’t fully open yet. So we were a bit scuppered for food to be honest! But managed to bag some baked beans from reception and the fella there very kindly dug us some frozen bread out of his home freezer for us, and we managed to persuade him to sell us one of his wife’s bottles of wine too… Success! Phew! Thank goodness. These baked beans though. Very unusual. Slightly ‘exotic’ you might say…. They come in Ham Sauce…. Ham sauce?? Yes – sauce made of ham…. 0.5% ham anyway. Obviously someone somewhere thinks that ham us such a selling point over just regular beans, that it’s worth putting slices of it on the front of the can…? I have no idea what went on in that marketing meeting, but it was clearly someone’s leaving do the night before! It was a 4 mile round trip to the only restaurant in town.. But worth the effort because it was also the only bar in town! Had to go for a seaside themed celebratory dinner this time. Bit too deep fried for my liking, but tasted better than the sausage I had yesterday. Gum Diggers Cafe, Ahipara – Awesome Breakfast! This bad boy is topping the breakfast charts at the moment. Sausage is still a bit suspect though. The breakfast chart has been the hottest debated topic so far on this holiday, sadly we’ve still yet to have an evening meal really worthy of note. The Fishbone Grill pictured has just secured it’s place right at the top, not only for serving up the first proper sausage, but also for the sauce. Sauce with your breakfast seems strangely lacking over here, of both the red and brown variety. Fishbone however compliment the fry up with a lovely tomato relish and a non too picturesque, but damn tasty mushroom sauce. A wonder to behold, this is probably the best breakfast I’ve ever had! Should be though, it cost enough, $18 and that doesn’t include the coffee..
Can’t remember the name of the restaurant, but the burger was a Surfer Dude! It certainly filled a lunchtime hole, couldn’t even finish all my chips.